Today marks the official start of the Christmas Season and I wanted to share a Christmas card. We had a gorgeous snowfall a few days before Thanksgiving, and it is still with us, along with some frigid temperatures. So I thought a snowman card would be appropriate. Isn't this Snow Family adorable? (I got mine at Simon Says Stamp, but it has disappeared now). I decided to color it using the color scheme from Doodlebug Design's Home for the Holidays papers that were part of the Simon December Card Kit. (the striped panel is one of them). I used markers to color, a mix of Spectrum Noirs and Letrasets, and added a bit of prisma glitter on the snowflakes and along the ground. Other elements come from Simon's Christmas Sentiments stamps and die, Penny Black's Snowflake Trio die, cut from silver foil cardstock, and Doodlebug Ladybug Doodle twine. Thanks for visiting today. I'll see you again on Sunday with a sad announcement. Happy Wednesday! Are you ready for Thanksgiving, American friends? Wishing you all a wonderful day, full of family and friends and turkey! It's time for another Simon Says Stamp Wednesday challenge, and since it's the end of the month, it's Anything Goes! The design team is using Tim Holtz or Ranger products this week. We'd love to see you using yours, too, but it isn't necessary to enter our challenge. Today's card uses some supplies that were in the Simon exclusive 2013 Holiday Card Kit, inspired by Tim Holtz. From the kit, I pulled out the Santa stamp, one of the District Market notecards, and the Christmastime rub-ons. I wanted Santa's beard to be white, so I stamped him with charcoal mid-tone ink on ivory cardstock, then colored him in with a flesh-tone marker, some fired brick distress ink, and a bundled sage distress marker. Then I cut him out, and glued him to the music background, cut from the notecard. This is the first time I've used these rub-ons, and I'm really impressed with their quality! I was able to ink around my panel with fired brick distress ink after I'd put them down and they stayed put nicely. Next I pulled out a piece of Tim Holtz red Core'dinations Kraft Core Nostaliga cardstock and embossed the snowflakes, then sanded them to bring out the kraft, and put that panel on my kraft card base. After gluing down my stamped panel, I thought these corrugated stars dipped in glossy accents and then in Festive Berries distress glitter would go nicely, so they were popped up to finish. I wanted to enter another card for the Hero Arts Holiday Challenge, into the "A Few of My Favorite Things" category. The elements here are truly some of my favorite things: snowflakes and snowmen, the pool color, and the technique of heat embossing is still a favorite of mine. I started with my last bit of this Pool Designer paper - it is perfect for a swirling snow background! Then I stamped and heat embossed the gorgeous Dazzling Snowflake, using HA white embossing powder. I did the same with the sentiment from Holiday Sayings (a great set of small Christmas sentiments that is now evidently discontinued). And my snowman is from the Snow Much Joy clear set. He is a perfect size, can be colored with markers or pencils, or easily paper-pieced, too. And he's easy to cut out! I could not resist this adorable reindeer pattern, and decided to let it be the star of the show by using a variation of Heather's sketch from last week's Simon Says Stamp Wednesday Challenge. I added my own Doodlebug Ladybug Doodle twine, a button, and some hearts punched out of glitter paper. The sentiment is from the Big Holiday Wishes stamp set in the kit. I used solid cardstocks from the kit (LOVE that limey green!) along with more red glitter paper for this one. I decided to leave the sentiment off of this one, and cut it into a tall skinny card, still 5 1/2" tall, but just 3" wide. It might even work for a gift tag to attach to a gift, with room inside to write a note. This kit is a real KEEPER! Don't wait too long to order it, as I'm sure it will sell out like its sisters! I just received the December Card Kit from Simon Says Stamp yesterday and couldn't wait to play! The first thing I pulled out was the Maryanne Snowflake stencil and the white cardstock, along with my own distress inks: broken china, salty ocean and peacock feathers. I started with the lightest ink color and pounced it over the stencil, moving the stencil haphazardly all across my paper panel, and gradually changing ink colors as I went. Such fun! I liked the result so much that I cut it in half so that I can get 2 cards out of it. Then I inked the edges and attached it to my white card base. The other elements here are a sentiment from Kelly Purkey's Let it Snow stamp set, and the Eliza Snowflake die, along with one of the Penny Black Snowflake Trio dies, layered, popped apart with foam adhesive, and centered with an aqua pearl. I am really enjoying the few stencils I now own, and am looking forward to adding more to my collection! I've been enthralled with the PBS Masterpiece series "The Paradise", and especially with the beginning photo credits before each episode. They used beautiful jewel toned laces and other lush materials. I'm sorry to see it ended, but if you haven't seen it, you can watch the 7 episodes online at the link above. Loved the story-line, loved the costumes, loved the characters! Now that it's over I thought I'd make a card to commemorate it. I started by stamping and clear embossing the Hero Arts Lace Background on a panel of Pool layering paper, then sponging on Peacock Feathers and Salty Ocean distress inks. That panel was affixed to a teal card base. The result also reminds me of the lovely gown that Denise wears in the later episodes. Then I die-cut some Leanna butterflies from royal blue foil paper and stamped a sentiment from The Craft's Meow Dream Catcher on a scrap of the same Pool paper using Memento Luxe Danube Blue ink and added them along with some sequins that Heather gave me when I visited her in Ireland. It's time for a new challenge at the Simon Says Stamp Wednesday Challenge! The Design Team and our Guest Designer Jess are all using Authentique papers and/or Jane's Doodles stamps. They're not a necessity to play with us, but if you have them, we'd love to see them on your card! All of the design papers are from the beautiful Authentique 6" paper pad Thankful. Each of the prints have a solid on the reverse, so there were lots of choices for my banners and feathers, which are the smallest of Simon's exclusive Pointed Feather dies. I added 2 buttons, some natural twine, and some Doodlebug BonBon Doodle twine. The sentiment is from The Craft's Meow's Golden Days, stamped in vintage photo distress ink. Okay, it's your turn! I can't wait to see your take on the sketch! As usual, Heidi has provided us with another $50.00 gift voucher to the Simon Says Stamp Store for the random winner of this week's challenge. Hello! I'm here today as part of a cross-promotional blog hop featuring The Craft's Meow stamps and Perfect Paper Crafting products! The TCM Design Team were all given a tool of our choice to play with; here's the card I made using it and my TCM stamps from our Under the Tree set. I chose the Perfect Layers Border Tool #1, and used it to frame up my stamped image. It really is precise, and very easy to use! All my papers are from the Echo Park Christmas This & That paper pad, and I colored my stack of presents using that striped paper as a guide for my colors. I kept my design very simple today to show off the stamp and the tool. The Craft's Meow is currently having a HUGE sale on retiring stamp sets HERE. And Perfect Paper Crafting is offering a 5% discount on their tools for all hoppers. The code to enter at checkout is meow5%. 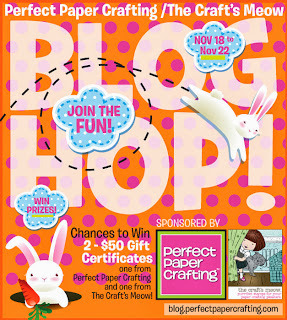 Don't forget to leave comments at all the hop stops, because there are TWO $50.00 gift certificates to be won - one from Perfect Paper Crafting and one from The Craft's Meow! If you happen to get lost along the way, the hop starts HERE and you can find a listing of all the stops there, too. Now, hop along to my talented teamie Sharri's blog. I had fun building my snowmen with the elements in the Build a Snowman set; it was like playing with paper dolls! I decided on an aqua, red, and white color scheme, and placed my snowmen against the Jolly Chant background, stamped in aqua ink on aqua paper, and then stamped one of the sentiments from the Love and Joy cling set in red on my snowbank. I added a little glitter to the top of the snowbank and to the tossle on the little snowman's hat, and punched out some red and white snowflakes to finish. My snowmen's hats and scarves were colored with markers. I hope you'll join us all week as each of my Penny Black Stamp Squad sisters will be featured each day with a card she made for this fun joint venture! And then play along over at Designed to Color for a chance at a prize of THREE Penny Black Christmas stamps! Hello again! Today I'm playing with a Simon exclusive Christmas stencil. These are really fun to use! I secured the Believe stencil to a piece of red cardstock that I trimmed to be exactly the same size, and then spread on some modeling paste, removed the stencil, and sprinkled on some Ritz microfine Cool Highlight glitter - it gives the sparkle of newly fallen snow! After an overnight drying, I added my panel to a white card base, and then added the beautiful Eliza Snowflake to it, centered with a large pearl to hide the foam square I used to pop it above the surface a bit. If anyone's wondering, the stencil measures 6" tall by 3" wide, easily mailable in a business envelope or one of your own making. Don't think that you need a medium of some kind to make these stencils work......next time I'll try using it with just some inks. Thanks for visiting today - have a great weekend! We had our first snowflall earlier this week, but I think it will be melted soon, just in time to clean up the fallen leaves that it covered! Don't you just love the gorgeous font on this sentiment? It makes me think of Charles Dickens' A Christmas Carol! I had just seen Shari's card and video where she demonstrated how to use the wonderful watercolor paper along with the evergreen bough and iced spruce distress inks included in the kit to make her background, so I had a play, too, using her technique of dragging the paper through some watered down inks. Before they dried I also spritzed them with some perfect pearl water, (the perfect pearls are also in this kit). After drying thoroughly, I stamped a music background using iced spruce ink, then overstamped the trees using evergreen bough. That panel was then affixed to a dark green Core'dinations card base. The beautiful sentiment was stamped and heat embossed on vellum and framed with 2 burgundy strips of cardstock. And the snowflakes are Penny Black's Snowflake Trio dies, cut from silver glitter paper, and centered with a clear rhinestone cabochon. For my next card, I added the Simon exclusive Falling Snow stencil to the mix, along with some chunky Twinklets Diamond Dust glitter, sprinkled over the embossing paste while it was still wet. This time I started by stamping and heat embossing the wonderful horse and sleigh near the bottom of a white panel. Then I tore another piece of scrap paper and used it as a mask to cover my stamping while I sponged on tumbled glass and iced spruce distress inks for the sky. Leaving the mask on, I then overstamped my trees in evergreen bough. Then I removed my mask, layered on my stencil and applied embossing paste and the Twinklets, adding them also to the snowbank line and along the sleigh's path. To finish, I added this sentiment (not from the kit, but perfect for my little scene, don't you think?) embossed in Ranger Super Fine Detail Silver powder, along with the fun silver tinsel that was in the kit, and I added my own little jingle bells to the corner - they really do jingle! Here's a picture of the Holiday Card Kit. You can choose either cling stamps or clear ones. And look at all the things I haven't even played with yet! Don't wait, as when it's gone, it will be gone forever! Happy Hump Day - that means it's time for a new challenge at the Simon Says Stamp Wednesday Challenge Blog! This week our theme is Thanksgiving or Thank You. The Design Team is playing with Hero Arts products this week, one of my favorite companies! My first card uses a clear stamp set called Season of Giving, which appears to be out of stock at the moment. I used the largest of the sentiments and then stamped, colored, and fussy-cut some of the smaller images in the set to form my wreath. (the maple leaf is from another HA set Happy Thanksgiving). I added some pearls in autumnal colors, and a twine bow. to the Simon Says Stamp Store. To start I sized a digital poinsettia by Jane Beljo into 2 sizes, then printed them out on vellum. Since I had had smearing problems before, I immediately sprinkled some clear embossing powder over them and heated them - problem solved. The heating made them naturally curl a bit, so I had instant dimension, too! Then I used 2 shades of pink markers to roughly color them in, and then fussy-cut them out and layered them up, three-deep, adding white pearls to the center. My dry embossing is a Cuttlebug embossing folder called Juli's Garden, embossed on Core'dinations whitewash corner hutch. Then I sanded it to bring the pink out a bit more. My sentiment is from The Craft's Meow's Christmas Lantern, embossed in white. Just had to keep on playing with this big Dazzling Snowflake woodblock by Hero Arts! This time I white embossed it on pool layering paper. It is so big that there isn't a whole lot of room left for a sentiment, but the new Simon/Tim Holtz Holiday Card Kit came to the rescue! The stamps in it are advertised as card sized, and this one fit nicely at the bottom of my card. I embossed it in silver. The silver snowflake die is the largest of the Penny Black Snowflake Trio dies, cut with silver glitter paper, and I centered it with one of Tim's mirrored stars, also from the Card Kit. A Moxie Fab Thanks Blog Hop!! When Cath announced that she would be leaving Moxie Fab World, my heart hit the floor. Her blog posts brightened my day and I always had a sense of anticipation for what she would have in store for us each time I opened that day's post. Cath has a special place in my heart because she noticed my work, as she did so many of us card makers, and gave me the confidence to keep on doing what brings me such joy. Her naming me as a Moxie Fabber of the week is one of my personal highlights. She praised us for our creativity, and then gave us inspiration after inspiration to keep our creative genes growing. So when I was contacted to be a part of this blog hop for Cath, I was in immediately. What a wonderful way to show Cath how much she means to each of us! This may well be the biggest hop in history, and that's as it should be, because it gives us all the chance to honor a very special lady. You should have arrived here from Jamie Gracz/Avery Elle's blog. Here's my card for Cath, from the heart! The elements on this card are all things that mean something to me, and I hope it makes her smile. I wish you as much joy as you have given us. Enjoy this resting time, recharge, and I know that you'll be back with us doing something that is meaningful to you and to us very soon! Your next stop on the hop is Michelle Woerner's blog. Enjoy! And many thanks to Keren Baker, who came up with this fabulous idea and organized the whole thing! As a celebration of this week's Fan Favorites Event at Penny Black, the Penny Black Stamp Squad are teaming up for a Blog Hop! We hope you spy some personal favorites along the way! You should have arrived here from my talented teamie Greta's blog. If you'd like to start at the beginning, just hop on over to the Penny Black Blog, where there will be a list of our blogs, and once you get started, you'll be directed from one to the next. Here's my card for you today. The moment I saw this extra large cling wreath stamp, I knew I wanted to play with it! It's called Holiday Delight. It's a big one, measures 5" at its widest point! I paired it with the sentiment from Joyous. Both were stamped in black ink on ivory cardstock, then I colored in the wreath with Spectrum Noir markers, added some tiny gold and red pearls, and attached it to an aqua card base. Now it's time to hop on to my team-mate Rosemary's blog. I know she'll have something really special for you! Thanks for stopping, and Happy Shopping!! Hi! I'm back again to show you a couple more of the stamps that are included in this week's Fan Favorites promotion. My first one uses the lovely Holly Tree stamp, paired with a sentiment from a new 2013 set called Robin's Wish. There is something so appealing about this sweet little tree! I simply stamped it and colored it in with my markers, stamped the sentiment, added the red ribbon and attached my panel to a green card base. My 2nd card uses some pattern papers along with my stamped and colored image, called Give Us a Kiss. Again I colored him with markers, and then added some glitter to his hat and the snow he's standing on. The sentiment is from the clear set The Wonder. In case you've missed the details about this special upcoming sale, you need to be a member of the Penny Black Club. If you aren't, do it NOW - it's free! Then, tomorrow, November 8, you'll receive an email with a link to start shopping. The sale will run on the selected stamps from November 8 throught the 15. It's that easy! Happy Wednesday - that means a new challenge at the Simon Says Stamp Wednesday Challenge!! This card uses only 3 of the many elements in this stamp set, one of the sentiments, a large striped snowflake, and a tiny one. I inked them up in Hero Arts Navy and Tide Pool mid-tone inks and Salty Ocean distress ink. Then I added some Lawn Fawn snowflake sequins in silver, white and aqua and some Hero Arts Sea gems and pearls. to the Simon Says Stamp Superstore! I'm really looking forward to seeing your CAS designs this week! 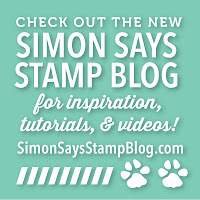 And for daily inspiration and grab-bag giveaways, please visit the Simon Says Stamp Blog! Good morning! Have you heard about the Fan Favorites event going on over at the Penny Black Blog? How does it work? Just sign up to be a Club Member, and on Friday, November 8, you'll receive an email with a link to start shopping!! It's that easy! The Penny Black Stamp Squad were given some of the stamps that are being offered, and this week we'll be sharing some cards we made to show you some of the stamps that are going to be on sale beginning November 8. Today I'm using 2 of the stamps For this card, I used Floral Story and, in the background, Harmony. I love this stamp because of the text included it its background, and it was very simple to color using my markers. I stamped my red card base with the lovely Harmony cling in red, and then attached my stamped panel which I had sponged with old paper distress ink. The sentiment is from a new 2013 set this year called Season's Wishes. 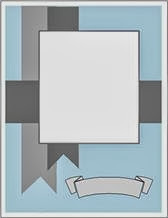 All I added to my card was this sheer ribbon bow, secured in the middle with a tiny red button. The Crat's Meow Christmas Blog Hop! Welcome - it's our monthly blog hop at The Craft's Meow!! Our theme this month is Christmas - we want to show you all the many ways you can use our stamps to make some stunning Christmas cards. If you came here from Larissa's blog, then you're on the right track. If you just happened to stumble upon my blog and want to start at the beginning of our hop, please go to The Craft's Meow Blog for a list of participating blogs along with their links. Once you get started, you'll be directed from one blog to the next. This one uses the little round peppermint drop and the holly leaves from our Santa's Little Helper set, and my sentiment comes from Karen's Holiday Foundations. I wanted to try and replicate a favorite, but now discontinued Christmas design paper. The original had a background of music and words, with blues and greys and silvers, but I decided, because of the inks I own, to make it aqua and kraft and white. My card features Nina's beautiful Vintage Snowflakes set. I started with a piece of Basic Grey solid paper, flecked with beige, and stamped the music and sentiment (Inside Christmas). Next I overstamped Nina's snowflakes in aquas and embossed white. I went around the embossing with some tumbled glass distress ink to make it stand out more and edged my panel with broken china distress ink before attaching it to my kraft card base. My sentiment is from Clare's Christmas Lantern. To finish I added some snowflake dies and aqua and brown pearls. The background music paper is from Webster's Pages, and the postmark and sentiment are also from this same set. I added some gold pearls to the flower center. We wanted you to know that Lisa is having a 3-day sale beginning today on all Fall stamp sets!! They'll be 20% off Nov. 4, 5, and 6 only - the code is Fall20 at checkout!! Now, hop on along to Nina's blog. And don't forget to leave a comment at The Craft's Meow Blog before 8:00 PM Pacific time on Wednesday, Nov. 6, for a chance to win a $15.00 gift certificate to The Craft's Meow store!